Objective statement: Provide information on the type of position you are looking for. To a certain extent you can tailor this to fit the job you are applying for. Skills: In this section list some of the skills that you have that match up to those that that the position you are applying for requires. Use a bulleted list to display relevant skills so that they stand out. Using bullets draws the eye of the reader and they will immediately see your skills meet the job criteria. If you are new to the field and don’t have many skills that come with experience, try and list some transferable skills that are related. Formal qualifications and certifications: Provide the details of any nursing programs or degrees you have completed. Include where you received the training, the date graduated and degree or certification granted. Include your nursing assistant certification, the state you are certified in and date it was issued. Any additional certifications should also be included. Employment history: List all previous nursing employment beginning with the most recent, and a summary of what your duties were in each job. Highlight duties that correspond to those the job you are applying for will require. 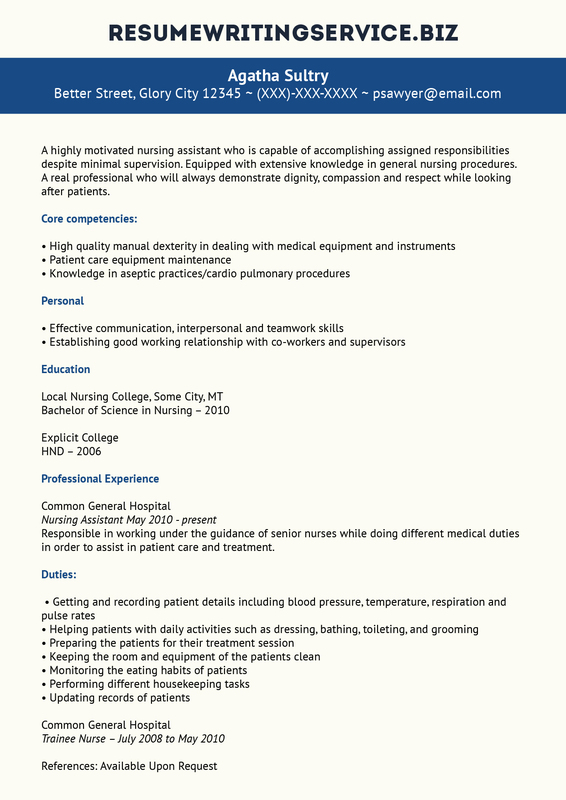 A sample nursing resume can be useful when you write your own resume for nursing assistant. The sample can serve as a nurse resume template and show you how to organize information you are providing in the most effective way. Feel free to review our nurse practitioner resume for extra dose of inspiration! Is the resume neat and pleasing to the eye with a good balance of white space and text? Does the resume fit well on the page? Does the resume use bullets, bold text and other highlighting techniques to attract attention to important information? Is the resume written in the best format to show off your abilities? The completed resume should look professional, be easy to scan, and draw the eye of the reader to important relevant information that qualifies you for the position. According to the Bureau of Labor Statistics there are 1,545,200 nursing assistants employed in the U.S. The median income for a nursing assistant is $25,090 per year or $12.06 per hour. There is a strong demand for nursing assistants and the field is expected to grow by 17 percent over the next 10 years, which is faster than the average for all occupations. If you need to review a nurse manager resume, we are kindly ask to browse our website! If you experience any issues with your nursing assistant resume, we are ready to give you a hand!